Can you describe how you intend to improve the data knowledge and application on the team? Modern marketing is all about data. Whether you're a content writer, SEO, or social, the most competitive organization needs to have data integrated into every aspect of the business -- not just a siloed team that we kick analysis work to. It would be the power of self multiplication so I can always be playing outside somewhere. 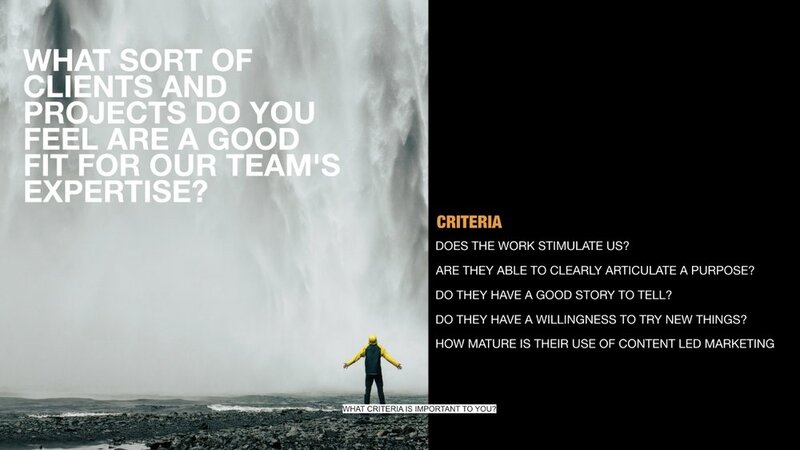 THERE IS NO SINGLE ANSWER ON THE RIGHT PROJECT OR CLIENT, SO I THINK ITS IMPORTANT FOR US TO DETERMINE AS A GROUP THE CRITERIA FOR WORK WE WANT TO TAKE ON. How do you feel about wearing sunglasses in the workplace? This is a tough one so I had to call in my son for a lifeline. Finn what is your answer "As long as you own it." If you had a free Saturday, what would you do? Q: With the mass of data available, how do you decide what you want to measure to capture insights that will inform content? A: Focus on the goal. Once you understand the reason someone is wanting to create something you can then imagine the different ways content can achieve this goal. For example, if the goal is to Build Brand Awareness, content to achieve this goal is very different from Lead Nurturing. This short slideshow is an example of how we guided a client through a workshop to help them understand how to align content to a purpose. A year from now, what metrics (concrete or otherwise) will illustrate our success? > Completeness of team capabilities. > Case studies that get recognition in the industry. > Espresso Maker on 7th floor. A: The current structure is really our transitional approach as we work together toward the relaunch of the agency group for 2019. That is when we’ll settle on and roll out a long-term model. Clients are demanding more content marketing and content-driven experiences, which is why we leveraged the Wiley business to build a world class content offering with the search team (from Brand) and the social team (from Engage) helping to drive connection back to the legacy businesses. We’ll continue to evolve our “matrix” this year and settle on our structure for the new year.